Malware authors often attempt to hide their work by giving them the same name as system process. The difference comes down to location. I am just about fed up with Windows Vista running so much stuff in the background that I don't understand. I've become obsessed with checking out what processes are running and then Googling them. The problem is most sites then tell me it's a legit MS program - often described as being important for stability - then in the next paragraph they say that the same exe file is a registered Trojan or virus. The latest was 'csrss.exe' (two at the same time). When I looked it up it was explained it should be in the system 32 folder, but I have one in there and another somewhere else that I can't find - task manager will not show the file location for either! I can certainly sympathize with Windows Vista's complexity. This isn't a simple operating system any more, and it's not something that can be "pared down" to just a couple of running programs. Vista will always have lots of processes running. It's not a good thing, it's not a bad thing, it's just a thing ... a reflection of a large and complex operating system that's trying to do a lot. But the point you raise is a good one. Virus writers often try to obfuscate what they're about by naming their virus files the same as system executables. As you've seen, csrss.exe in one place is critical to system operation, and yet csrss.exe run from some other place is most likely a virus. Make sure that both the anti-virus and anti-spyware databases are up to date - most will update automatically, so you need to make sure that this is happening, and happening daily. "I never use Task Manager anymore ..."
As you point out, Task Manager will show you that multiple copies of something called "csrss.exe" may be running, but it won't tell you where they reside. Enter Process Explorer. This is a free download I've often referred to as "Task Manager on steroids". I never use Task Manager anymore, just procexp. Here you can see that on my machine csrss.exe is running from c:\windows\system32 - exactly where it should be. The properties dialog contains a whole host of information about any running process. 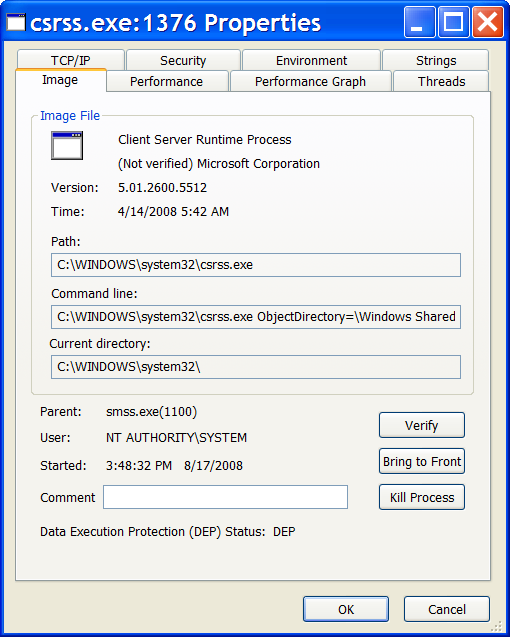 In this "Image" tab you can see not only the location of the executable being run, but also any command line parameters that might have been passed, its current working directory and more. The other tabs show even more information. As I've discussed in other articles, svchost is the "Service Host" executable - it acts as a "host" within which other services can run. 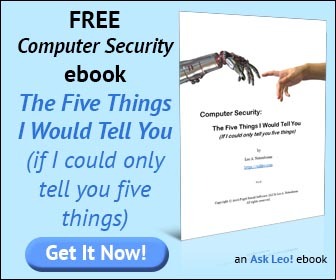 You'll often find multiple copies of it running on your machine, and each one may be host to one or more Windows system services. Here you can see that this particular copy of svchost is running many services on my machine. Since there are already multiple copies of svchost.exe running, it's a common target for malware authors to "slip in another one" that might run from a different location in the hopes that you won't notice. If you suspect a problem, svchost.exe is just like csrss.exe - it should be running from c:\windows\system32 and nowhere else. What is svchost, and why is there more than one copy running? 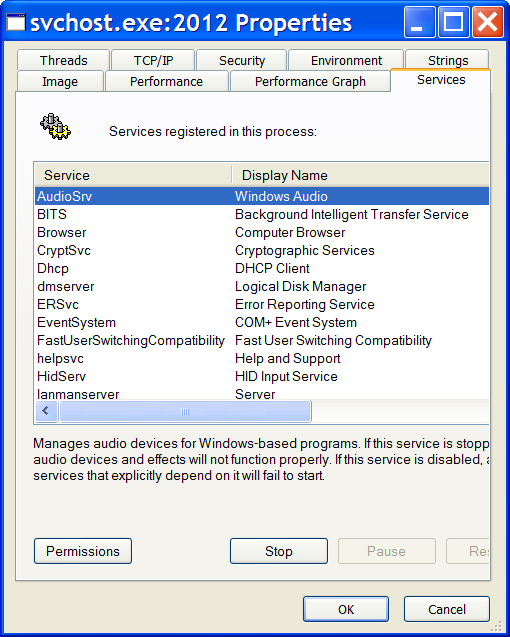 Svchost is a component of Windows. It can be confusing because more than one copy is running, and it often shows up in errors caused by viruses. Where is it alright for svchost.exe to be? Svchost.exe is frequently spoofed by viruses attempting to hide. The official copy should be in your Windows\system32 folder, but there may be others. I also found system explorer to be a useful utility. Excellent article. I've been looking for a good replacement for Task Manager. Thank you very much! Another good program to look at is Autoruns, it shows ALL running processes, you have the option of terminating temporarily or permanently. Autoruns does not show you what's running now. It shows you what runs automatically at boot, login and other times. But for example if those programs run automatically and then exit (as some do), they will be listed in autoruns, but they will not actually be running at the time you look. Different (and very good) tool, but for a different purpose. Thank you very much finally an explanation about svchost.exe I can understand and a great tip on process explorer. In windows, and specifically in Vista, could malware run through the taxi svchost.exe, INSIDE the system32 folder? For instance, is it not possible that executed malware, in the form of injected code, could edit say a trojan to run from your system32 folder under the system taxi svchost.exe? Or better yet, list itself there as a regular service like: Dhcp, DHCP Client? HOW do i check where DHCP client is? And if svchost.exe connects to the net, with an illegitimate service running from the system32 folder, what then? how do you check each instance of svchost.exe's connection, with only knowing it is svchost.exe connecting from the system32 folder? If you cannot, this would be a great taxi for more then windows services. As much as i search, i find no answer to this question, and only hints that it is possible. Hopefully you can shed some light on the situation, thanks! I'm not really sure what you mean by "taxi", that's a term I've not heard used in this context. Could SVCHOST be used to run malicious code? Absolutely. What then? Same as any other virus, you take steps to eradicate it as best you can. Normally there's an additional file that contains the malware and scanners would look for and remove that. However prevention remains the best approach by far.